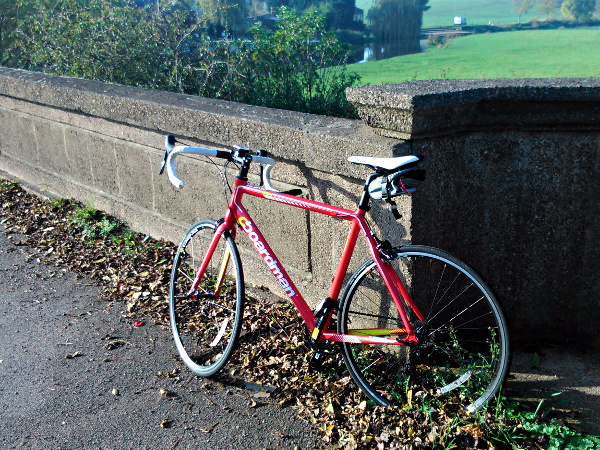 In my late ’20s, I bought a bicycle, a Raleigh Routier, from a cycle shop in York. I used that bike quite a bit, most memorably for rides to and from Durham and Bishop Auckland from Hartlepool in 1989, and a 40-odd mile round trip to work in Derby from my house in Markfield, one summer day in 1990. I’d had bikes when I was younger of course, but that was the first one I ever rode over any significant distance. That bike was stolen in the early ’90s and I didn’t own a bicycle for many years after that, but about ten years ago I bought another bike and started cycling again as a means for getting to and from work. When I started a job at Nottingham University I took my bike on the train between Spondon and Beeston each day. I replaced that bike with a car in 2008 after which I cycled only occasionally. 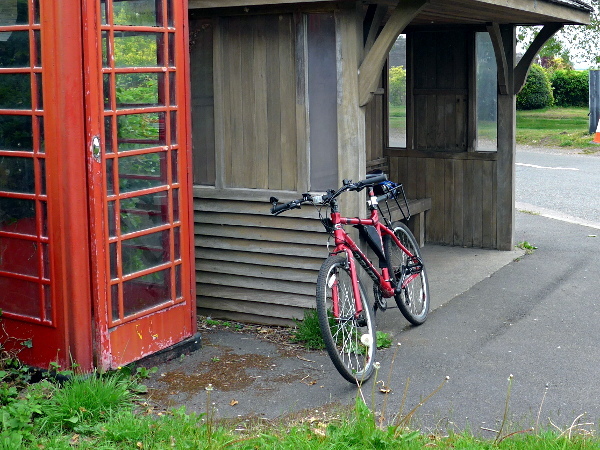 A bike I was particularly fond of, my Ridgeback tourer, was damaged in a collision with a car in 2010. That brought a halt to my cycling for a while but I bought a new one, a Carrera hybrid in 2013 and went out on it five or six times that year. I don’t think I went out on it at all in 2014. But at the beginning of 2015, a friend on a music forum started a conversation about cycling, setting himself a target of 1000 miles for the year. Thinking that I should use my own bike more often, I offered to do 500 myself. 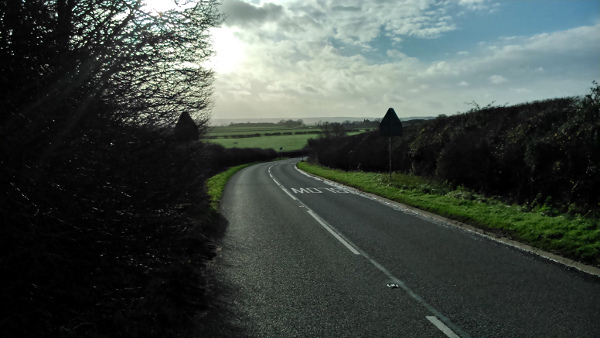 I set off on my first ride of 2015 on the 9th of January. I took a wrong turn through a farm gate, and was bitten by a dog, just below the knee. I think I managed about 7 miles on that first outing. Undeterred, I kept going and had reached my target of 500 miles by April. Naturally I moved the goalposts for myself and decided I’d try for 1000 miles in 2015. But I’d hit that by June. Eventually I set my sights on 2112 miles by December 31st, 2015. I came to find cycling compelling, addictive. It appeals to me in so many different ways. Firstly, and perhaps most importantly, it undoubtedly keeps me fit. The roads and country lanes of North-West Leicestershire are not flat. I recall cycling home to Derby from Nottingham University one day in 2007, and nearly collapsing once I arrived. Yet the same distance (14 miles) would be an unremarkable run out for me now, of the sort I do every other day. Secondly, it has been a terrific challenge, at least once I arrived at a suitably demanding target. Despite being a fundamentally outdoor pursuit, it also appeals strongly to my inner (perhaps outer) nerd. I have taken great and lengthy satisfaction from planning rides using online maps and route planning tools, calibrating my bike computer, making use of GPS devices and preparing spreadsheets to document my progress and provide various statistics. The satisfaction of entering another ride distance into the spreadsheet and seeing the yearly total climb a little further toward the target is a powerful motivation. I sometimes go to sleep pondering the number of miles I need to do in each of the remaining months, mentally distributing them according to the probable provision of daylight hours and decent weather. I even quite enjoyed learning to adjust the derailleur gears on my road bike. The quality of construction and design of the bicycle has evolved quite a bit since I bought my Routier in 1989. But even more significant has been the development of tools and accessories that make the cyclist’s life easier. It’s possible to plan routes on an online service (I like the course creator at bikehike.co.uk) that will determine the exact distance, show you a gradient map and export routes to another device if necessary. Much easier and more convenient than unfolding a map, then drawing on it with a pencil, as I used to do 25 years ago. Frame-mounted GPS units or watches will show the exact distance travelled and even record your route. Take a smartphone and you have a handheld device that will pinpoint your location on a map at any time, as well as providing a camera (all of the photos in this piece were taken with an Android phone, and I’ve used it for navigation purposes more than once). And bike lights, once bulky and powered by heavy batteries the size of small tea mugs are now small, lightweight objects that will give bright light for many hours on a pair of AAAs or even a coin cell. Cycling has given me an opportunity to explore the area surrounding my home to a much greater degree, over the last year or so, than I had ever done in the preceding five years that I’ve lived here. I’m very fortunate to live in a rural area with a wealth of potential cycle routes through leafy lanes and farmland. I have mainly used a small number of regular routes which I’ve planned or discovered for myself through the early part of 2015, but there have also been occasions, time having permitted, when I’ve taken a random, unknown path quite spontaneously. My favourite ride is a 25 mile route that takes me through Swepstone, Snarestone and Twycross down to Sheepy Magna, then across to Market Bosworth and back through Barton in the Beans, Nailstone and Ibstock. I often do that one on a Saturday when the weather permits, accompanied by a football commentary on Radio 5 Live provided by a DAB personal radio strapped to my arm, pedalling quiet roads in open spaces. Joy. I have never been so conscious of the weather expected for the following few days, or of the sunset times. I have learned that weather forecasts are generally quite accurate over four days or so, but that even when the next three or four days are forecast to be rainy, there’s nearly always a sufficiently dry interval to get out on two wheels (I am prepared to go out onto damp roads on my hybrid, but not in actual rain. I insist on defiantly dry conditions for my road bike to leave the garage). Most of my excursions have taken place during my lunch break. They often provide a very useful means of clearing my head of the mental clutter of work. But during the summer months I often venture out during the evening as well, making the most of the more numerous daylight hours. On a few occasions I’ve gone out after dark, and that’s a very different experience, but quite rewarding, despite – or perhaps because of – being unsettling sometimes. Out in the country the spaces between villages, perhaps a mile or more from the nearest artificial light save the ones attached to your bike, can be very dark indeed. 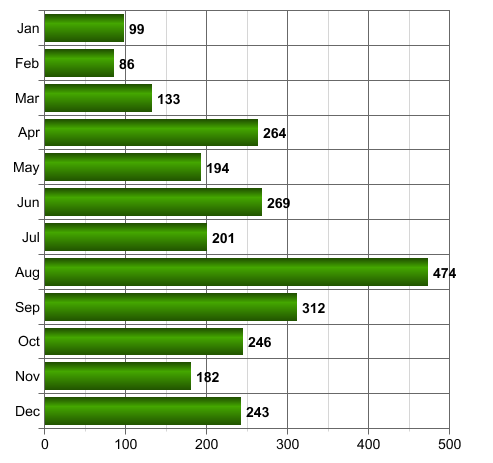 I hit my target of 2112 miles in October, and by the end of 2015 had cycled 2702 miles. But of course, I didn’t stop there. I set myself the same target for this year, 2112 miles. And I’ve already done 103 of them. Because you see, the road goes on forever.